Disappointments can be hard to handle, especially if they are your child's. It's even harder if you have the automatic urge to protect him or her from disappointment and make things all better. Here is a masterful and touching example written by Rachel Macy Stafford of what happens when you use Language of Listening® coaching skills to follow the child's lead instead. I didn’t know my daughter had her heart set on earning a specific recognition until several days after the program. She described how it felt to sit there as they called out the recipients. I held her, remaining silent, resisting the inclination to jump in there and cheer her up … complain about the selection process … or remind her that awards do not make her worthy. I am learning that oftentimes, our children simply want to be heard in hard moments such as these. I am learning that oftentimes, I unintentionally exacerbate the problem by bringing my own baggage into the conversation. As my child and I laid there in silence, my hand in hers, I distinctly remember watching other kids win the awards and accolades I thought I had a chance to earn. One middle school year was especially soul-crushing. But how I felt about not getting that award may not necessarily be how my child feels. I am learning to let her tell me what the problem is rather than just assuming it is the same problem I had at her age. 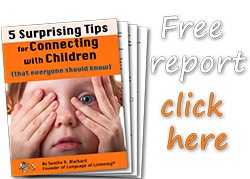 As my children face challenges and disappointments that I also faced as a kid, I find myself referring to my colleague Sandy Blackard's perceptive Language of Listening® insight. Sandy points out that our emotional reactions to the problems our children face often come from past events in our childhood, as do some of our solutions, especially if we have experienced similar situations – exclusion, ridicule, fear, failure – when we were young. Our emotions can cause us to miss important details about the situation our children are facing and influence how they experience it. Sandy says that in order to support our children and remain open to THEIR solutions, it is important for us to step from sympathy (feeling what our child is feeling) into empathy (understanding what our child is feeling and thinking). Instead of offering advice, attempting to understand their point of view on the situation will allow us to play the more important role of a supportive coach, helping them figure out their own solutions. When an empowered child tries something, even if it doesn’t work, he or she is more likely to try again. To help our children figure out what will work for any problem, Sandy suggests we start by finding out what they think the problem is. That way, their solutions will address the “right” problem – the one they feel ready to address. After five minutes of silence, my daughter spoke up. She was onto a new topic: the talent show that happened yesterday, open to all fifth graders who wanted to perform. She’d brought her guitar and played a rendition of “Photograph” by Ed Sheeran that made her teacher cry. “What was your favorite part of the show?” I asked. She then told me her friend tried … and she shined. “Things like that are better than awards,” my child decided, coming back to the original topic. My daughter fell asleep quickly and peacefully. Our talk offered a soft place to rest her head, with dreams of more “Encourager Moments” that define her by WHO she is, not by the awards she does or does not receive. Reprinted by permission of the author Rachel Macy Stafford from her Facebook post of May 22, 2018. 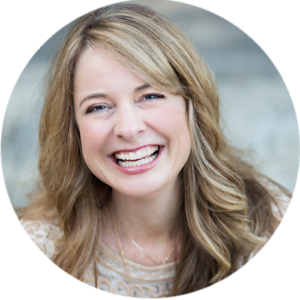 Rachel Macy Stafford is the author of Hands Free Mama blog and three bestselling books: Hands Free Mama, Hands Free Life, and Only Love Today. You can join Rachel in The Hands Free Revolution—letting go of distraction, perfection, and pressure so there is more time, space, and opportunity for love. This is so good, Rachel. Thank you for modeling it for us and then taking time to write it down and share. In my family of origin, no one modeled this kind of listening. The default response was always a quick fix – “Well, you just need to look at it this way . . . ” It left me with a lot undone inside, but fortunately God gave me friends later in life who offered an empathetic ear. Blessings on your work and your Free Hands. Sue, it sounds like Rachel’s post spoke directly to you. She would be so happy to hear that! What would you suggest or even say if they remain silent and do not talk about it? Brigid, it sounds like you have given this some thought and have arrived at a conclusion similar to what I would say–in the case of an upset, stay silent when your child is silent, and SAY WHAT YOU SEE® when they are expressive. It sounds like you already know or sense that as your child’s coach, your role is to follow their lead (always inside your boundaries). To me, crying counts as expressive. Usually a child who comes to you or wants a hug while crying will melt into your arms when you acknowledge their feelings, too. One who hates to cry may not let you near them in the first place, so you would honor that preference and let them come to you when they are ready. As long as your child knows you are NOT there to fix their feelings, but instead are there to make sure they get to feel whatever they feel (crying helps children accept things they don’t like), your presence will be helpful whether you talk or not. They will usually let you know what works best for them.